A couple of weekends ago, I decided to give my wife’s cruiser a little spin to get a taste of the beach life. Of course, with temps close to freezing, I couldn’t get the complete picture. This was the first time that I’ve actually taken a lengthy ride on this type of bike. I’ve done the occasional test ride, but I’ve never taken one for a true spin. It’s definitely a different experience. All of my bikes are designed to put me in a forward riding position, but the cruiser puts me upright. It was awkward at first, but I soon discovered that it was more comfortable on the neck and back. Another obvious difference is the spread of the handle bars. The cruiser’s bars are wide and angled back. Although this worked well with the upright seated position, the steering was less responsive. Since the cruiser is more for slow, casual riding, I didn’t see this as an issue – just different. The single speed gearing seemed perfect for flat, smooth terrain, but required a bit of work to haul it up hill. Granted, the seat position was lower for my wife, so I couldn’t get a nice leg extension without standing. I’m thinking that with the right seat height, inclines would be more manageable. The overall ride was fun. There’s something about the carefree personality of a cruiser that removes any intention of getting anywhere fast. 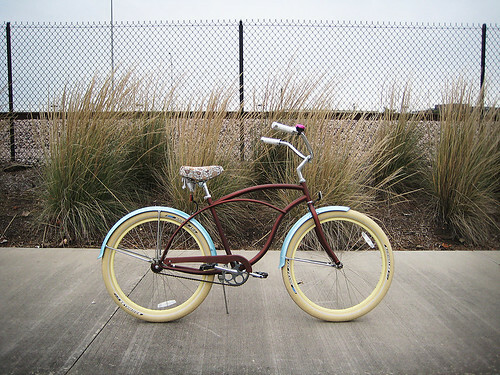 When you detach that from the ride, all you have left is a relaxed, comfortable and enjoyable spin around town. 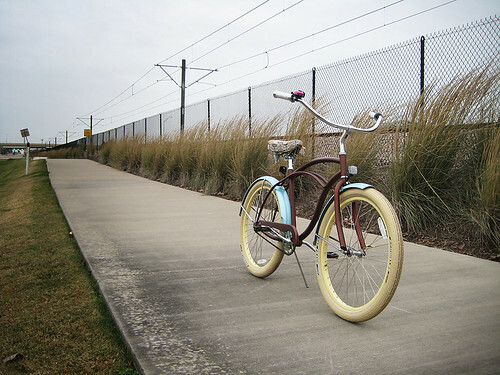 The cruiser is obviously more about personality and less about utility, which is why I have one on my bike wish list.